Why are we led to believe wheat is unhealthy? Whole grain is an important part of our daily nutrition. Sure, a big bowls of pasta every day isn’t healthy, but we need whole grain as part of a well-balanced diet. Wheat has come under fire recently. The rise in gluten-free dieting has left many questioning its nutritional value. One-third of American consumers are trying to eliminate gluten, and subsequently wheat, in the hopes of losing weight. But the U.S. Department of Agriculture advises adults to eat between 3 and 5 servings of whole grains a day, and 6 to 11 servings for children. It is hard to talk about wheat without mentioning its relationship to gluten. Walk into your local grocery store and the popularity of gluten-free products is astounding. Even foods that would never contain gluten are being stamped with the famous “GF” mark. We recently discussed “the gluten myth” on D2D and can confirm: gluten is not the enemy. Many non-celiac afflicted people choosing to maintain a GF diet do find they experience sudden weight loss, however, this is from the elimination of an entire food group and sudden change in eating habits. This is not gluten weighing you down. And whole grains are an important part of a balanced diet. Some researchers have taken issue with modern wheat because it has changed from its original form. In order to keep up with a rapidly growing population, wheat farming has adapted. As such, mass-farming has manipulated the wheat we consume today relative to the wheat that our ancestors consumed. The creator of modern wheat, Norman Borlaug, a biologist from Iowa, won both the Nobel Peace Prize and the World Food Prize for his positive contribution to farming. 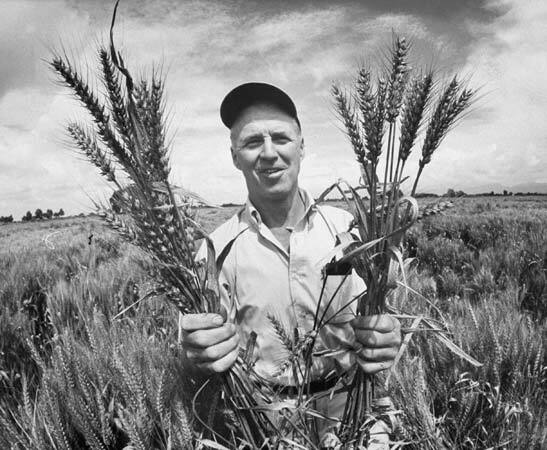 Borlaug was able to roughly double wheat production per acre. Instead of long grain stalks, wheat farmers are now producing higher yielding crops, which are smaller in size—18 inches in height compared to the traditional 4-foot tall wheat plant. These crops are smaller in size due to the weight of excess grain now created per stalk. If they maintained their original height, the stalks would not be able to support themselves. While these crops produce more wheat to feed the growing population, it is argued that these crops are less nutritious. One anti-wheat proponent, who lobbies for all humans to eliminate wheat from their diet is Dr. William Davis MD, author of Wheat Belly. According to Dr. Davis, we are victims of “Frankenwheat”, which he considers addictive and toxic. Davis asserts that today’s wheat contains a protein called gliadin that, Davis argues, “has the potential to bind to the opiate receptors of the human brain—like heroin or morphine—except it has a different effect of course. Wheat doesn’t provide relief from pain, it doesn’t provide a euphoria, it only stimulates appetite, so that people who consume modern wheat are triggered to consume 440 calories more per day.” (Davis, Wheat Belly). Davis believes that consuming gliadin tells your body it wants more carbohydrates and as a response, you end up overeating. These excess carbs eventually are stored as fat. Dr. Davis believes if you eliminate modern wheat from your diet you will see a noticeable change in your hunger levels, lose weight, and benefit from positive health changes like decreased blood pressure, low blood-sugar levels, and less joint pain. How much of this argument should we hold true? According the article “Does Wheat Make Us Sick and Fat?” published by the Journal of Cereal Science, Davis’ understanding of gliadins is misleading as gliadins are present in all forms of wheat, including ancient grains. In some cases, “modern wheat” actually contains less gliadin than the grain of our ancestors. The article reports, “there is no evidence that selective breeding has resulted in detrimental effects on the nutritional properties or health benefits of the wheat grain” (Shewry et al., 2011). 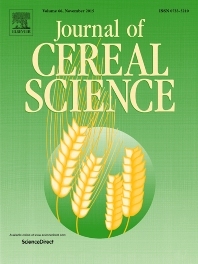 As for Davis’ theory regarding wheat opioids and their effect on the human brain, the Journal of Cereal Science also discredits this claim. According to a 2008 study, although gliadin is known to release a peptide called gliadorphin, which can induce an opiate-like effect, the compound’s composition of 7 amino acids actually cannot be absorbed into the intestine. Because of this, gliadin is not present in its original form in the circulatory system and therefore the opiate effects of gliadorphin do not affect the central nervous system. The evidence of this study undermines the Wheat Belly argument concerning gliadin. Therefore, Davis’ claims cannot be substantiated given today’s scientific understanding of wheat. So why do “wheat-eliminators” lose weight and subsequently feel better? Again, the answer is the drastic change in diet. When you eliminate an entire food group from your diet—especially one that you consumed frequently—your system is shocked and responds rapidly. Especially if the wheat you were consuming before making this switch was an indulgence, like pasta, bagels, or even pretzels. You aren’t eliminating gliadin, you are eliminating junk food! Another anti-wheat assertion is that wheat consumption is a contributing factor in long term brain diseases, such as dementia and Alzheimer’s. David Perlmutter, MD is the author of the national bestseller, Grain Brain: The Surprising Truth about Wheat, Carbs, and Sugar. Perlmutter argues that the modern human diet has steered off course, relying heavily on carbs, whereas our ancestors’ diet was mostly fat and protein-based. One of the biggest issues Dr. Perlmutter and Dr. Davis have with processed grain is its ability to spike your blood sugar levels. When your blood sugar increases your body creates more insulin—and while insulin helps keep the glucose level of your cells healthy, too much insulin will cause your cells to desensitize. Davis and Perlmutter, MD believe that this leads to inflammation and inevitably may contribute to Alzheimer’s. However, data that shows a very weak link between blood and glucose levels and a risk for developing Alzheimer’s. This conclusion is considered to be a far stretch with current evidence. In order to consider the harmful effects of inflammation, we must examine inflammation and its relationship with your body’s insulin and blood sugar levels. Both Grain Brain and Wheat Belly discuss the effect whole grain can have on your blood sugar by highlighting the fact that two pieces of whole wheat bread actually raise blood sugar levels more than a Snickers candy bar. So, why is this? Processed grains, like whole grain or white bread, cause blood sugar levels to rise, but you should not be scared away from wheat by the glycemic value and its likening to a chocolate bar. The nutrients of the two foods are very different and you cannot draw a conclusion on one being unhealthy because of its similarity to the other. Do you really believe that a snicker’s bar is healthier than a serving of whole wheat bread? As delightful as it tastes, a Snickers has 250 calories, 12g of fat, and 27 grams of sugar with little nutritional components. Two slices of whole wheat bread also have 250 calories but only 5 g of fat and include protein and fiber as nutrition. You also need to consider how much whole wheat is in the bread in question. For a serving of bread with a Glycemic Index of 71, the bread in question is processed whole wheat or white bread—but these are not your only options. 100% stone ground wheat is a low Glycemic Index food, for example, Ezekiel 4:9 bread has a GI value of 35. Additionally, you are typically eating the serving of bread with a protein, such a turkey or peanut butter, which can also slow your spike in blood sugar. 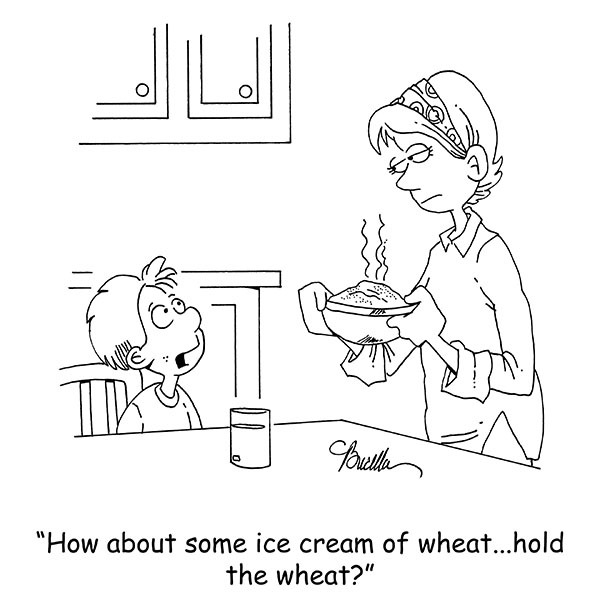 When discussing the glycemic index, you must also consider wheat’s glycemic load. The glycemic load relative amount of carbohydrate the food contains in an average serving. By taking each gram of carbohydrate into account, you are able to better estimate how the food will affect your glucose levels. Yes, the glycemic index helps interpret how quickly glucose levels rise, but the glycemic load helps interpret how long glucose levels will stay elevated for, ie. how much the sugar is affecting you. Read what our research says about Glycemic Index vs. Glycemic Load. So while two pieces of whole wheat bread can raise your insulin levels, consuming whole wheat will not lead to rapid weight gain. In his book, Dr. Davis makes the argument that our ancestors avoided diabetes because of their diet, which mainly consisted of wild boar, salmon, and berries. But there is no scientific data regarding the possible diabetic condition of hunters and gatherers! Not to mention, their diets relied entirely on what they were able to hunt or collect and their lifespans were much shorter than the average human today. As such, Dr. Davis is drawing hard conclusions from limited evidence. 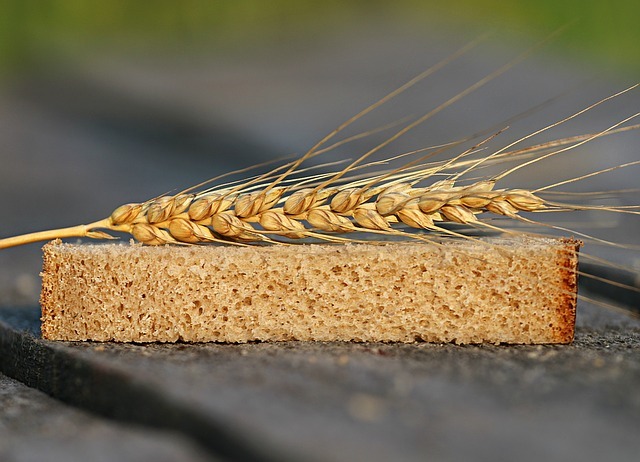 Complex carbs, such as whole oats, sprouted bread, or even pasta do not have the same effect on blood sugar levels as the average piece of white or whole wheat bread. This type of grain is actually helpful for keeping blood sugar levels low as they are high in dietary fibers and take a longer time to metabolize. The more refined the grain is, the higher your blood sugar will spike. While you want to be conscious of the amount of carbohydrates you eat, you should not eliminate the food group entirely. Yes, wheat has changed in shape, but it has not been modified to include less nutrients. Sure, reducing your consumption of highly processed grains, such as sugary cereals, is a healthy choice that will help you maintain a healthy weight. 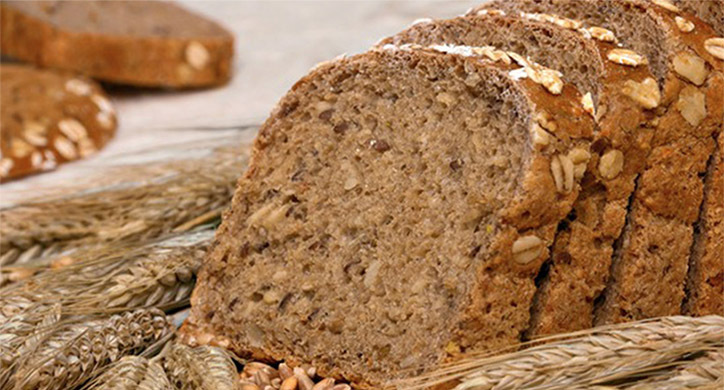 BUT you shouldn’t skip the healthy whole wheat options, such as whole grain oats or sprouted wheat breads.